All Season Pasture Mineral - Hudson Livestock Supplements Inc.Hudson Livestock Supplements Inc.
All Season Pasture Mineral can be described as a granulated mineral added to cooked molasses. It is used where protein is adequate such as in high quality summer forage or winter forage pastures. If a producer is using other types of protein supplements, All Season Pasture Mineral is an excellent mineral supplement for these situations as well. All the good nutrients in the world do not mean a thing if your cattle will not eat them. Every trick known has been tried to coax cattle into nibbling a few precious ounces of vitamins and minerals. All Season Pasture Mineral, palatability is not a problem because the vitamins and minerals are blended into a palatable base of pure sugar cane molasses. 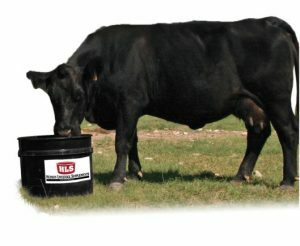 Cattle get the added advantage of the available carbohydrates from the cooked molasses, that improves forage utilization. You cannot get this out of granulated minerals.